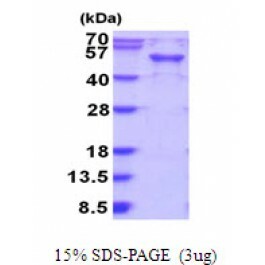 Guanine nucleotide exchange factor for Rab-3A isoform 1, also known as RAB3IL, is a 382 amino acid protein that belongs to the SEC2 family. RAB3IL1 is a guanine nucleotide exchange factor (GEF) for Rab3A. RAB3IL1 competes for an interaction with Rab3A and IHPK1 through its coiled coil domain, which does not require IHPK1 kinase activity. Luo H R., et al. (2001) Neuron. 31: 439-451.Rual J F., et al. (2005) Nature. 437: 1173-1178. 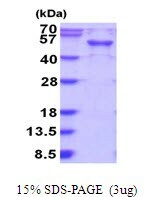 Recombinant human RAB3IL1 protein, fused to His-tag at N-terminus, was expressed in E.coli and purified by using conventional chromatography techniques. Phosphate buffer saline (pH 7.4) containing 50% glycerol.